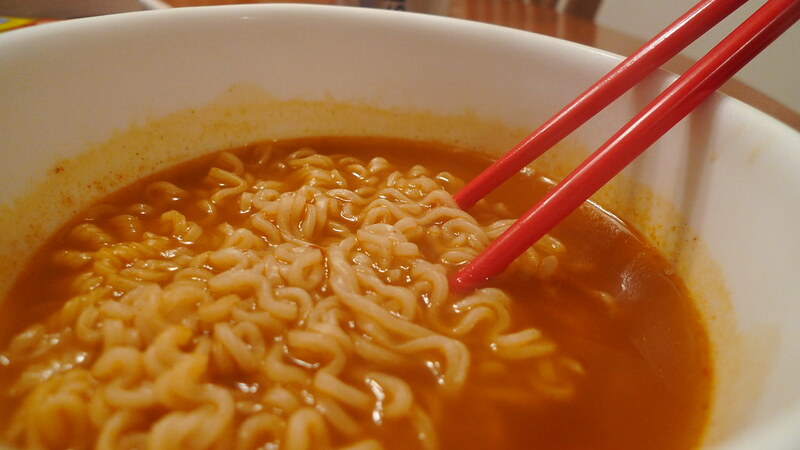 Nissin Top Ramen - chili. 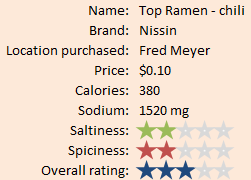 My last review for Top Ramen Week is for one that's a little newer and slightly less popular. 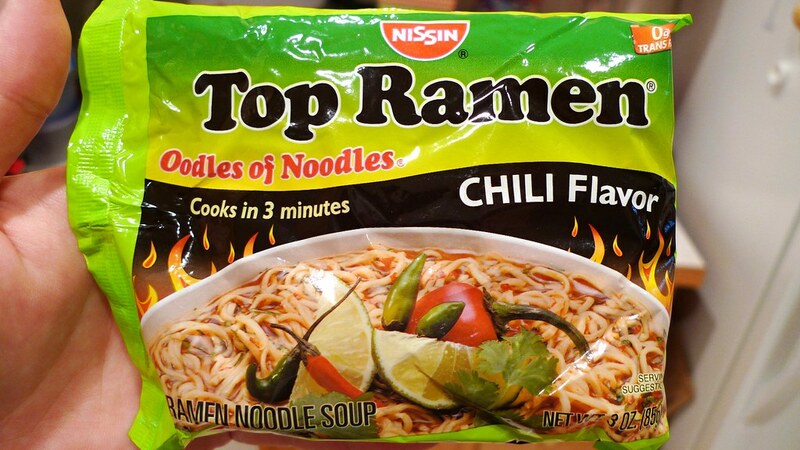 Chili is one in a series of spicy Top Ramen flavors; all of which are in green packages with flames behind the bowl. They've messed with spicy flavors before (remember Cajun Chicken? ), but can they finally get one right? Find out after the jump. 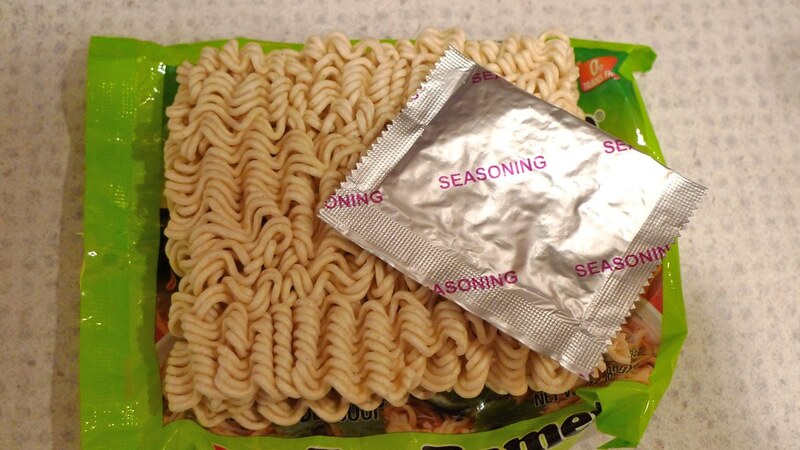 The brick of noodles and seasoning packet for Top Ramen Chili. One difference you might notice between this and other flavors is that the seasoning packet just says "Seasoning" on it. Most of the other flavors have "Chicken Flavor" or "Beef Flavor" on it. Wonder why this is. Top Ramen Chili is quite a unique flavor. It has the vague chili flavor, but also a surprisingly strong lime/citrus flavor. It's like if a Mexican restaurant made ramen. Really. The soup base is colorful and has lots of big seasonings inside. 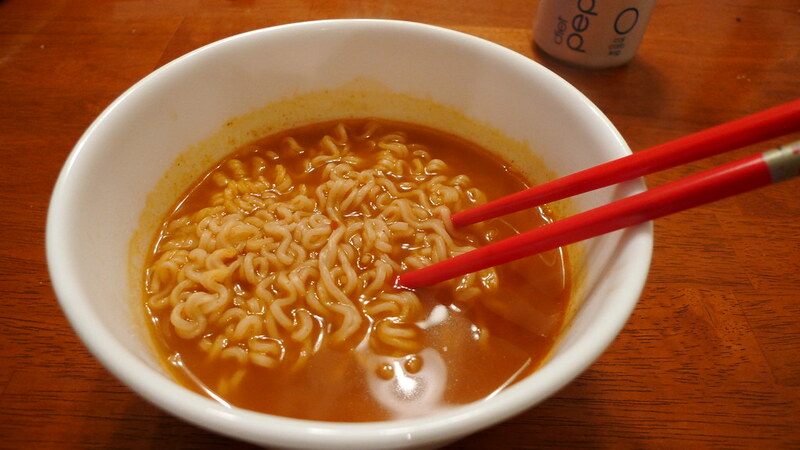 It's very similar to Nissin's Hot & Spicy Bowl Noodles, except those have meat flavors to them. Ready to eat some Top Ramen Chili. I love spicy things and can handle quite a bit of spice, so I could have had this be a little spicier. Most people would probably say that it's spicy enough, but not for us pros. The chili flavor is a little bit of a weird fit for Top Ramen. Closer view of the noodle soup. Julie did not try this because of the spice. I wonder when I can start giving her spicy foods again? I just had this today as a very unhealthy breakfast, but I was pleased to discover it reminded me of menudo! I am anxious to pick up another pack of Ramen Chili flavor and only use the seasoning to create a broth for simmering carnitas and hominy!